The Xiaomi Mi 3 comes with a custom Gallery app. It defaults to your camera roll with two shortcuts at the bottom that will take you to album view of your local images and album view of your cloud pictures. You can't change this view, nor can you customize the default folders. The available features when viewing a single image are pretty standard - set image as wallpaper/contact image, share it, delete it, enter edit mode or just get more info. The integrated editor offers various effects, frames, tools (crop, mirror, straighten, rotate, fisheye, doodle) plus light adjustments that let you bring out the shadows or the highlights. The MIUI music player is a custom app with a well-laid out, easy to navigate interface. It has a huge visualization screen doubling as a Now Playing windows. Below you get four non-customizable tabs - All Songs, Artists, Playlists and Online. The Online tab is where you pay for the Baidu Music service, which allows you to listen to their huge online track collection. Here you can also find various internet radio stations you can listen for free. The player has cool 3D effects, transitions and transparent elements, especially on the expandable Now Playing section. Xiaomi's Music app offers customizable equalizers with a few default presets already available for you. You can also try Xiaomi's MiSound enhancer, which comes into play when you use Xiaomi-branded headphones. Finally, you can edit song info and you can also enable automatic song info download in case the ID3 tags are empty. Lyrics can be downloaded, too. The phone has an FM receiver and supports radio recording. There is a sleep timer as well. Xiaomi's video player has very basic interface but rich video decoder support. It managed to play everything we threw at it but WMV files. AC3 audio codec is supported too. Interestingly, the player won't list MKV files, but it can still play them hassle-free, if you access them from the file manager. The video player, just like the music player, offers access to a paid video streaming services for movies and TV shows. Subtitles and pop-up play are not supported by the MIUI's Video app. 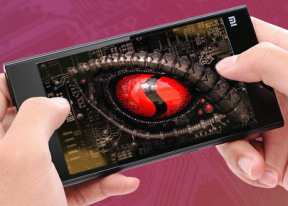 The Xiaomi Mi 3 is aiming at the proper flagship territory and it's facing some pretty serious rivals when it comes to audio reproduction qualities. The smartphone will have to prove itself against the likes of Samsung Galaxy S5 and, more notably, the HTC One (M8). Unfortunately, the Mi 3 just doesn't have the skills to be anywhere near the level required to fight it out for the best music player around. Its performance with an active external amplifier was a mixed bag, combining below-par volume levels with disappointingly high stereo crosstalk and distortion levels and less than stellar frequency response. The other readings were good, but they weren't enough to salvage more than a mediocre performance. It was more of the same when we plugged in a pair of headphones. 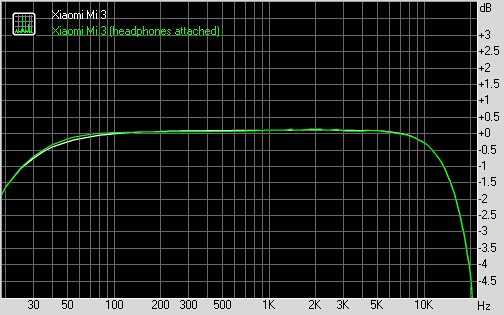 Stereo crosstalk worsened a bit more, while the other parts of the Mi 3 performance were at the same level as before. That's normally a good thing, but given that they were somewhat disappointing to begin with, we don't think it's worth celebrating on this occasion.